In the village of Vilemovice, which is situated in modern-day Czech Republic in the heart of Europe, there once lived a woman with her little son. She loved her boy very much. But she later married a widower who also had a little boy. The woman couldn't get used to her new stepson. He was in her way and she hated him. One day the stepmother got an evil idea. She took her stepson into the woods to pick some wild berries. They walked close to a rim of a deep abyss far away from the village. All of a sudden she pushed the child down into the depths and walked away thinking nobody would ever find the child's little body. But the child didn't fall all the way down. He was caught on some extending tree branches. Loggers cutting wood nearby heard his desperate cries and saved the little boy. He told them what had happened and the angry villagers punished the evil stepmother by throwing her into the very same abyss. Since then the abyss has carried the name Macocha - the Czech word for stepmother. The world famous Macocha Abyss has a dry pit with a depth of 138.7 meters (458 feet), making it the deepest abyss in central Europe. Underground Punkva River briefly emerges from Punkevni Caves on the Macocha Abyss bottom to form two small lakes. 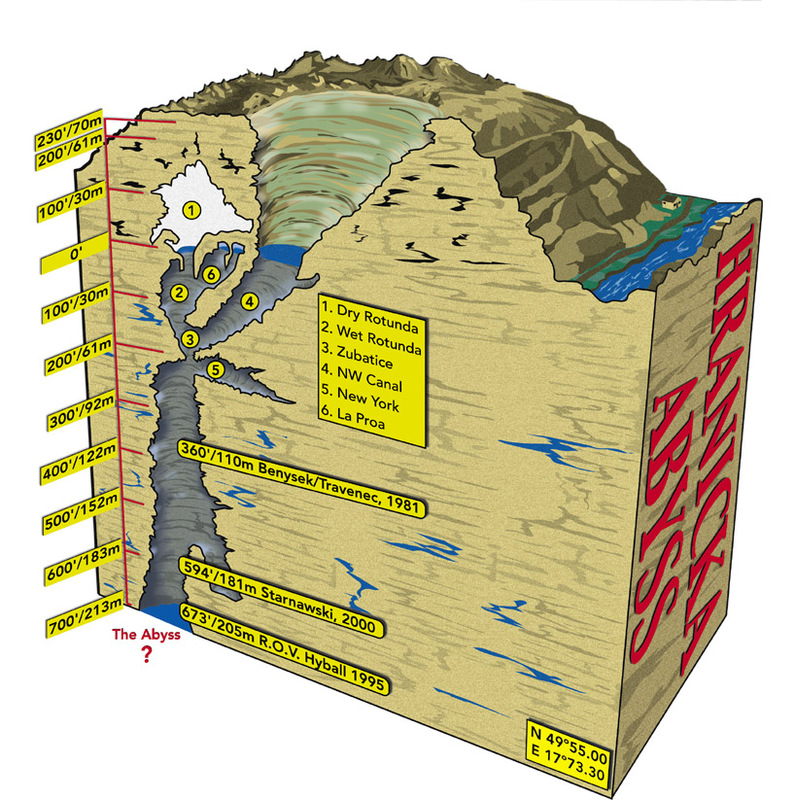 The Abyss originated after a Devonian limestone ceiling (approximately 350-380 million years old) of a large underground dome collapsed and the enormous shaft opened to the skies. Macocha Abyss lies in the unique Moravian Karst and Punkevni Caves. It is one of four publicly accessible caves out of the more than 1,000 caves in the area. First descents into the Macocha Abyss were documented in the 18th century. Today, visitors can reach the top via foot, mountain bikes and cable car. As a part of the Punkevni Caves guided tour, the bottom of the abyss can be reached by foot or electric, underground boats. In addition to century's old legend about its name, the bottom of Macocha has seen its share of tragedies, since many picked the sheer vertical cliffs as means to ending their troubled lives. A huge boulder near the Lower Lake is called a Suicide Rock. The bottom of Macocha Abyss and the two little lakes serve as a unique entrance to one of the most intriguing cave systems in the world. Exploration started in the early 1900s and after the World War II (any speleological activities in the occupied Czechoslovakia were banned during the war) well over 20 miles of underground passages were discovered up to date. Punkevni Caves are part of this large system called Amateurs' Cave in honor of the numerous amateur cave explorers working here for decades. The system has domes, galleries and corridors beautifully decorated with speleothems, deep pits, underground lakes, sumps and waterfalls and is a well-known archaeological and paleontological site. To dive in Macocha Abyss we have to transport our seemingly endless piles of dry caving, climbing and cave diving gear onto electric boats that take us through the maze of the underground Punkva River passages to the otherwise inaccessible bottom of Macocha. The quiet boat takes us through the Black Lake Dome with its chimneys leading to upper levels of the cave, through the Fairy Tale Lake, Dragon's Gallery and by the beautifully decorated Masaryk's Dome (named after the first Czech president Tomas Masaryk). The water depth in this tunnel is mostly shallow with two deep areas called "Forty" and "Hundred," according to their respective depths in meters. Summer air temperature at only 49F (9C) on the bottom of the Macocha Abyss doesn't stop explorers from sweating. Unloading the boats and carrying all gear another several hundred feet up and out of the dry cave passage to the open-air shaft of the Abyss and to the two little lakes is a lot of work. From the two observation platforms that enable tourists to look into the depths of the Abyss, divers gearing up for exploration appear like ants. An indispensable piece of equipment on the bottom is a caving helmet, as many visitors try to guess the depth of the shaft by throwing coins and rocks from the upper observation platform located almost 460 feet above. After suiting up, I climb over the safety fence that delineates the guided tour path as more tourists gather around to listen to Bach's monumental organ music played to demonstrate the excellent acoustics of the Abyss. A narrow winding path takes us by the upstream Upper Lake that leads to some sidemount passages and to the downstream Lower Lake where we finally enter the chilling 46F (8C) water. It is there that I notice the lake's bank has become the last sad destination for a small hedgehog that recently fell into the Abyss without any chance of ever climbing out. The lake water is milky; nevertheless, after the last gear check, down we go. The narrow passage angles sharply under the Abyss' cliffs and we lose daylight almost instantaneously. Questioning the sensitivity of my already freezing fingers used to Florida's balmy waters and dressed in bulky gloves, I notice with relief that the cave line is really a rock climbing rope. But the whole two to three feet of visibility does not require a line drill. The passage is pretty much a deep narrow crack in the limestone, similar to what we see above the water. My partner pauses to show me a side passage leading to a different part of the cave called Key Hole, but we follow the main line down deeper. I notice that the end of the line is just loosely coiled on a rock outcropping, but the tunnel levels out at 150 feet and soon we arrive at its end. Ahead is now impassable restriction that is plugged with tree branches, rocks and even a lawn chair probably sucked in during the spring floods. To clean the restriction and penetrate further will be a task for somebody else. We turn around, and I lead to get out of the numbing cold water. Moravian Karst is considered a cradle of modern speleology. Extensive archaeological excavations have revealed finds dated to the early and late Stone Age, the Bronze Age and the early and late Iron Age. Paleontological finds include bones of extinct cave hyenas, bears, rhinos, tigers and many other vertebrates and invertebrates. Many professional and amateur explorers, cavers and cave divers were involved in surveying and mapping thousands of feet of passages in extremely difficult conditions. Cold to freezing water and air temperatures, regular floods, rock and soil collapses and gear transport issues are only some of the obstacles the explorers face. Their successes wouldn't be possible without tremendous passion, skills, knowledge and the proverbial "golden Czech hands". We are drenched in sweat as we crest the hill and a spectacular view opens before us. The 70-meter deep chasm of Hranicka Abyss is lying at our feet. The view is breathtaking. Sheer limestone cliffs form the three sides of the chasm over 230 feet (70m) deep. The fourth side is a 45-degree slope with a pool of green water at the bottom. We will have to rappel down the slope with all our dive equipment, as the winch on the rusty old cable trolley works only occasionally and today isn't our lucky day. The Hranicka Abyss is quite unique in its morphology. It is a sinkhole located on the top of a hill. The hill is a part of a buried cockpit karst, characterized by a field of cone-shaped hills several hundred meters in height. Original characteristics of this dive site are intimately linked to the way it was formed. The majority of caves and sinkholes in karst regions around the world are formed by rainwater percolating from the surface and dissolving limestone along its way down. The Hranicka Abyss was created by CO2 rich warm mineral water rising from depths of 2,300-3,300 feet (700-1000 m) along fissures and dissolving limestone on the way up. The temperature of the mineral water (61 to 75ºF/16 to 24C), actually a weak carbonic acid (H2CO3), significantly accelerates the dissolution process. Once a large enough void is created, the overlying roof collapses, creating a sinkhole. These unique features present new challenges to spoiled Florida cave divers. Instead of driving right up to the sinkhole, we had to park our cars at the foot of the hill. For each diver there are at least two helpers, since all the gear must be carried several hundred vertical meters to the top of the hill and then again rappelled down over a 45-degree breakdown slope to the water. The diving presents another set of challenges as well. The dissolved CO2 forms a layer of noxious gas above the water, so all in-water preparations must be performed breathing through the regulator. Once submerged the CO2 causes tingling on exposed skin and eventually divers lips lose all sensitivity, which makes swapping regulators a little more interesting. The dive itself is spectacular; we first descend to 164 feet (50m), to Zubatice, where we take a water temperature reading, then ascend up to Rotunda. There we break up the water surface to see the dry portion of the cave. The atmosphere is almost pure CO2, so regulators must stay in place. A short swim through a vertical fissure reveals magnificent geyser stalagmites, formed by deposits from hot mineral water spouting through their center. From there we turn into another set of vertical fissures called Nebe. The water here is crystal clear and one can enjoy beautiful aragonite formations as well as the black void of the bottomless pit below. As the dive progresses Jakub suffers symptoms of a CO2 poisoning. The dive is turned, but the only way out is to descend back to 164 feet (50m) and clear the Zubatice before we can reach the ladder and start the decompression. The symptoms subside and we get a chance to visit the SW Tunnel as a detour to kill the time on deco. The dive is far from over when we reach the surface. Now we have to carry all the gear back up the 45-degree slope and then down the hill to the cars. There is a reason why local divers nicknamed this dive site a "Bend-o-Matic" (loose translation). Heavy exertion of pulling hand-over-hand on the rope on the way up the slope carrying bags of dive gear or twin tanks associated with helium-rich breathing gases threatens every diver with possibility of decompression sickness. Fortunately, our friends have arranged excellent support, so divers make only one trip and carry lighter loads. Another peculiarity of this site is the way the gases that are expelled by divers react with the mineral water. After each dive the visibility in the entire system is reduced to zero for several weeks. Use of closed circuit rebreathers is a preferred method for latest exploration and mapping. The Hranicka Abyss is closed to the diving public. Explorers on open circuit can dive here in intervals of three weeks or longer. To this date the Hranicka Abyss has no bottom, although the first divers broke the water surface in 1961. By 1968 divers reached depth of 289 feet (88m) and that was a practical limit for air dives in this CO2 rich water. The first dive on Trimix was accomplished by Lubomir Benysek and Frano 'Sabbath' Travenec on May 2, 1981, to depth of 361 feet (110m). The deepest dive to date is by Polish diver Krzysztof Starnawski, who in December of 2000, reached a depth of 594 feet (181m) on a night sneak dive. There were several attempts to find the bottom using ROVs, but technical difficulties and logistics obstacles did not bring the expected results. The deepest point the ROV reached was at depth of 673 feet (205m), but video and sonar data indicate that the abyss continues further down. Dry and underwater cave explorers in the Czech Republic are organized under Czech Speleological Society (visit their web site at www.speleo.cz), founded in 1978 as an umbrella organization for Czech and Moravian cavers. Due to the character of their caves, most cave divers there are dry cavers and explorers in the first place. Cave diving methods allow extending the penetration beyond the sumps and discoveries of many unknown areas are still to be expected. We would like to extend our thanks for support and collaboration to our caving partners, Radek Husak, Radek Jancar, Jiri Stetina, David Skoumal, Jirka Kanka and their teams.